The eyes of the sporting world are currently focused squarely on basketball, as the NBA Finals between the evil empire that is the Golden State Warriors and the one-man show that is the Cleveland Cavaliers are ongoing. Last night, the Cavs staved off elimination to win their first game in the series, by a score of 137-116 . As of now, the California crew still leads Lebron and Co. three games to one; that might seem daunting, but I think that last year's edition (between these same two clubs in this exact same scenario) proved that no lead is truly safe. Then, the Cubs followed up that epic comeback with a 3-1 switcheroo in the World Series that October. Moral of the story - you just never know what's going to happen. Anyway, this post really isn't about the ongoing Finals, nor is it about the National Basketball Association; however, it is about the basketball and yesterday's high profile match-up provide the perfect segue for the latest oddballs to make it into my grubby paws. A few months back, everyone's favorite Durham Bulls fan, The Snorting Bull, noticed that he had a few cards that have rested comfortably on my want-list for many moons. Well, I can now scratch them off of the list, because they arrived in the mail yesterday afternoon. Is there anything better than coming home after a long day of work to a bubble mailer full of baseball cards? Yes - that's THAT Tim Stoddard - the surly Major League reliever who intimidated batters from the mound from 1975-89, for the White Sox, Orioles, Padres, Yankees, Indians, and, most importantly, the Chicago Cubs. For that latter club, he was a key presence on the beloved 1984 National League East Division champions, the club that broke a 39 year-long postseason drought for the Northsiders. Of course, you probably knew all of that. 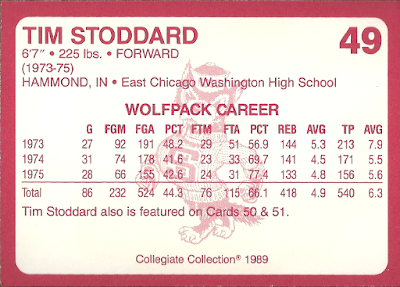 But, did you know that before he took the Major League bump, Stoddard starred on the hardwood for his college alma mater, North Carolina State? 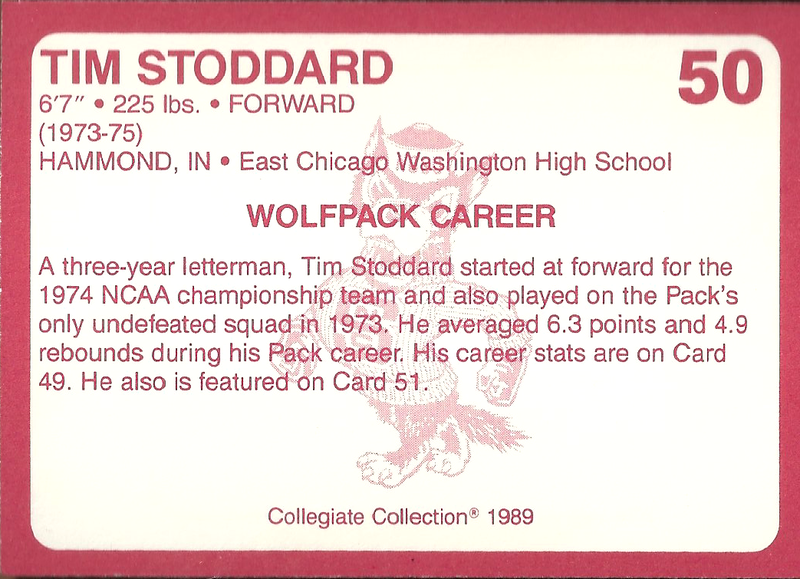 Courtesy of the junk wax staple that is Collegiate Collection, a group which put out countless collegiate-based trading card sets in the late 80's/early 90's, Stoddard's basketball stardom will know be forever documented in my collection. 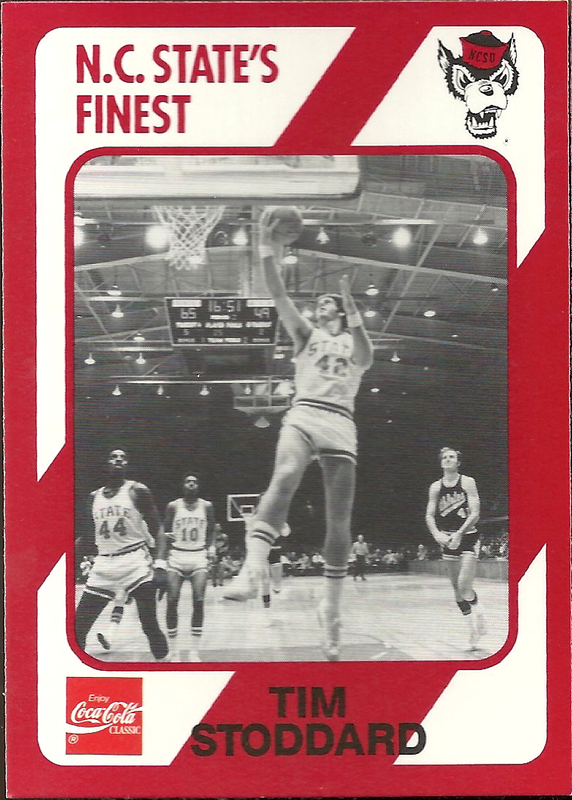 Plus, as you can see from the statistics printed on the back of his first card in the NC State set from 1989, he was a pretty good prospect, as well. While his first card (#49) features a vibrant, color portrait, his second (#50) makes use of an action shot, showing him going vertical for a layup attempt. 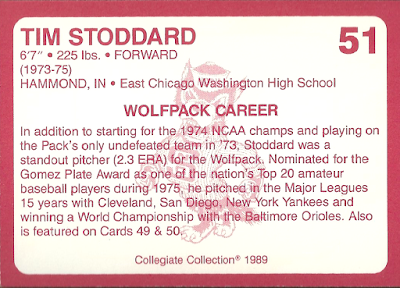 Stoddard made use of his gargantuan size (6'7", 225 lbs) to add a little extra "oomph" on his fastball and to scare the crap out of opposing batters, but it certainly helped him out in his basketball exploits, as well. 1974 NCAA championship. That season, Stoddard and crew went 30-1 on their way to breaking UCLA's seven year-long run on top. That said, what the back of this card does not tell you (and I'm surprised that it doesn't), is that Tim Stoddard is one of only two men in sports history to appear in both a NCAA Division I, Final Four basketball championship AND a World Series during their athletic career. After all, he was a member of the 1979 AL Pennant winning Orioles. The other man to pull off that versatile feat? Fellow former Cub, Kenny Lofton. Tim's final card on the checklist is another action shot featuring another layup, but at least we get a different angle, showing the full court in the background. I mean, my basketball collection isn't particularly vast and is mostly limited to modern product; however, I'll be damned if that vintage action shot isn't wonderfully fascinating and unique, to me at least. Tim almost looks like a super hero, with the rest of the players standing around the court in awe! However, despite the fact that this card features my favorite basketball image, the backside of the photograph features a write up on his career on the diamond. 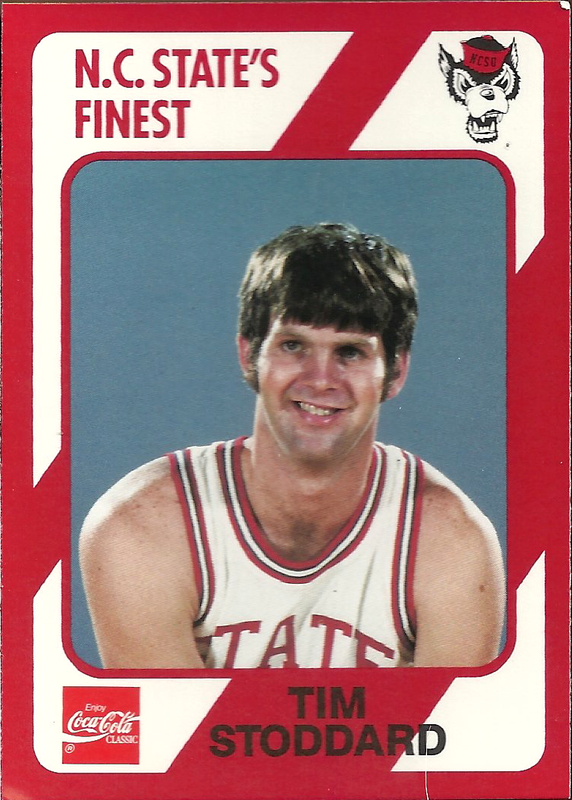 I mean, the last two cards dealt with and showed off his basketball career - couldn't we get one showing him in his NC State baseball duds? I don't want to sound unappreciative though - I do love all three of the basketball/baseball mashups. Over the years, the Cubs have employed the services of several versatile athletes - besides the aforementioned Stoddard and Lofton, former Cubbies Terrell Lowery and Steve Hamilton have appeared in March Madness competition. Furthermore, Hamilton and Chuck Connors have appeared in the professional ranks of basketball, as well. 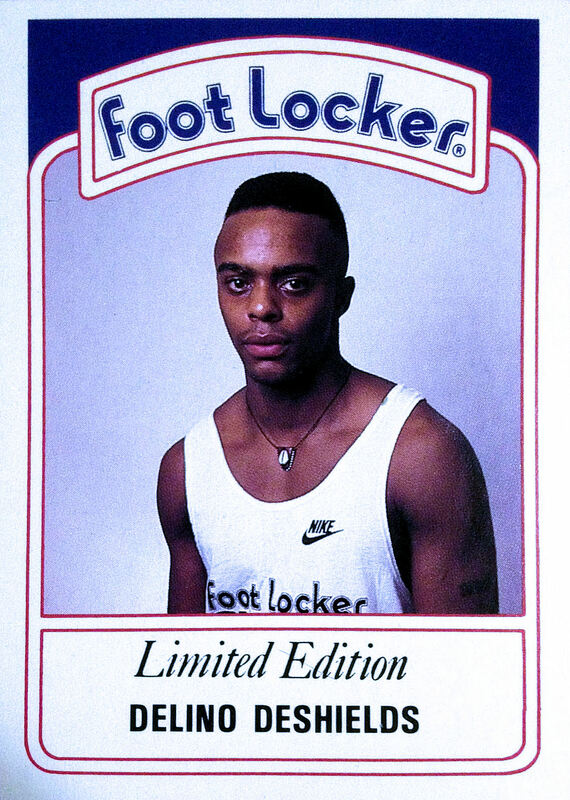 Plus, Delino DeShields has made appearances in slam dunk competitions, too. When it comes to other sports, Matt Szczur and Jeff Samardzijia have starred on the collegiate gridiron, requiring significant signing bonuses from the Cubs in order to lure them away from the NFL draft. It just goes to show you, professional athletes are amazing specimens of humanity. Maybe it's because I grew up in the era of Bo Jackson, Michael Jordan, and Deion Sanders, but I've always been fascinated with such athletic prowess. Thus, in the recent past, I've decided that I'm going to collect cards that feature these cross-sport phenoms, a collection of which the DeShields Footlocker oddball and the Szczur UD retrospective you see above are also a part of. These curiosities fall under the umbrella of my Nothing Major collection. 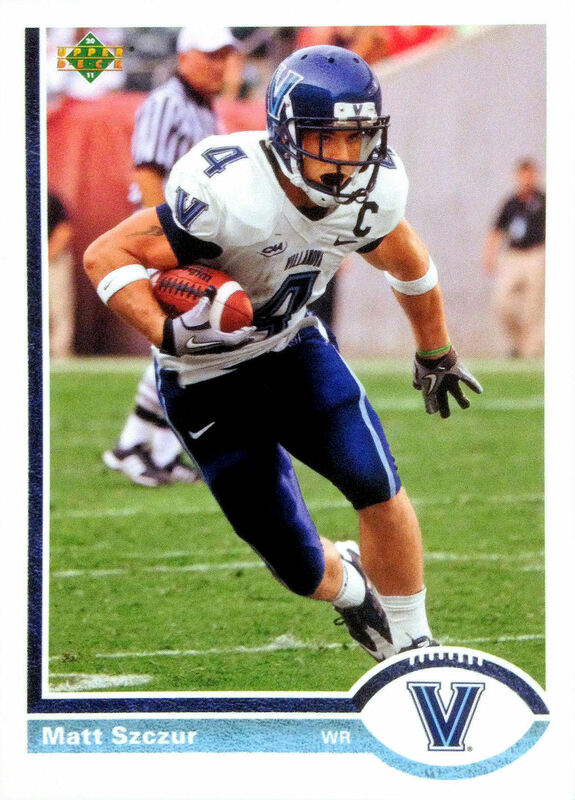 So, if anyone has seen one of Shark's Notre Dame football playing card from Hero Decks or Ernie Banks' celebrity golf tournament card from Upper Deck's 2012 golf set, please keep me in mind! Back on the topic of Tim Stoddard, he's quickly become one of my favorite Chicago Cubs of the 1980's. 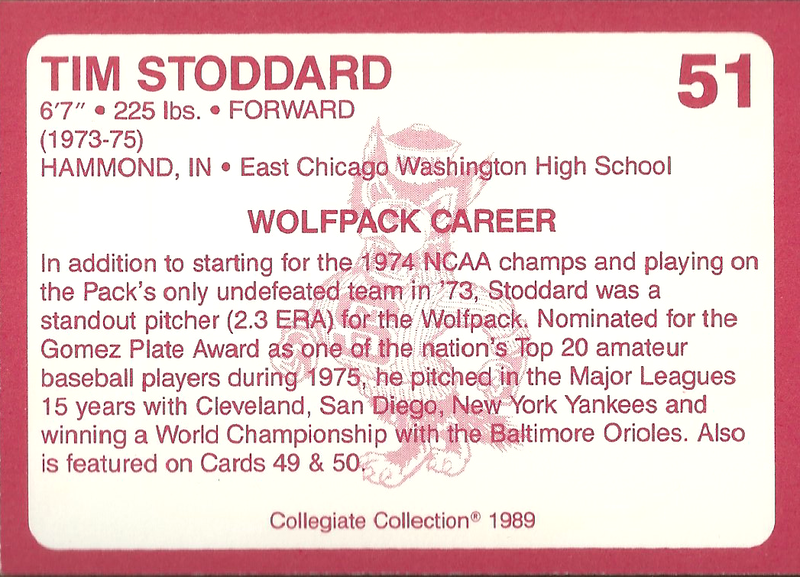 Besides the fact that he was a good enough athlete to turn heads on both the court and the diamond, Stoddard is also a local guy, hailing from nearby Hammond, IN, a town which worked next to for several years. Additionally, Stoddard is also currently serving as the pitching coach for the local North Central College Cardinals (Naperville, IL), a NCAA Division III powerhouse. As you can see, he's a pretty big name in this area. Yes - that role certainly wasn't a stretch for the big man, was it? Thus, with all of that in mind, you can see how thankful I am to Snorting Bull for forwarding these basketball beauties my way. 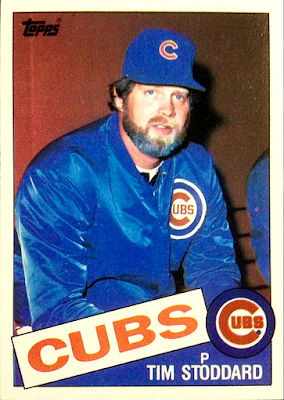 Not only are they cool, oddball cards, but they feature a multi-sport star who just so happened to spend time with the Chicago Cubs and also just so happens to me one of my favorite Cubs of the 80's, for a multitude of reasons. For that, I say thank you, Mr. Snorting Bull, and I assure you that I will get a proper thank you package in the mail ASAP, in return for your exceptional kindness. Is there anyone else out there in the blogosphere also obsessed with multi-sport athletes, or is it just me? Will we ever see such upper echelon versatility again or are we too stuck in our era of specialization? Please feel free to weigh in on this topic in the comments section below. In the meantime, I'll just be sitting here admiring my new Tim Stoddard basketball cards. I care more about Brian Jordan and Charlie Ward than probably makes sense. I wouldn't say obsessed, but they definitely intrigue me. Bo, of course, must be loved at all times. 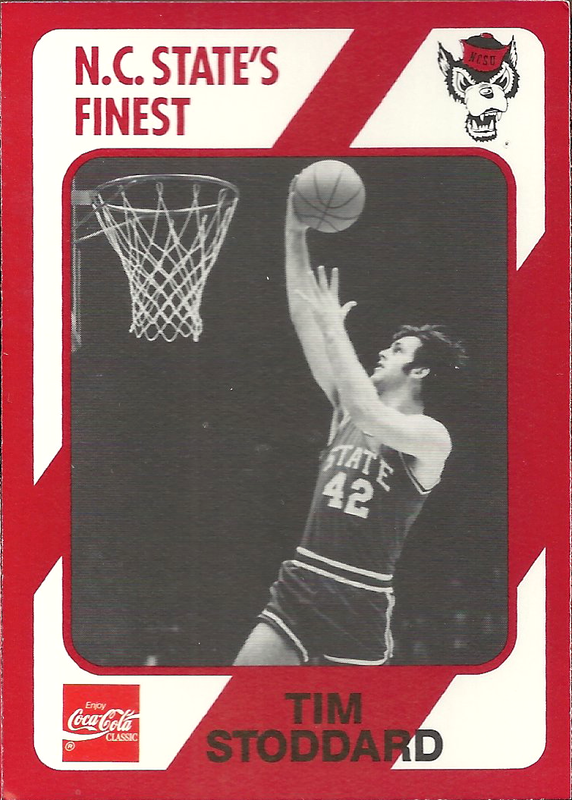 I love cards which feature two-sport athletes in their "lesser" sport, like my mini basketball collection of former Oriole Mark Hendrickson, who also played for the 76ers and Sacramento Kings. I have no real connection to Tim Stoddard and I just barely know who Matt Szczur is, but those cards are awesome. I might have to keep an eye out for the Szczur card. You have to start collecting Jimmie Johnson Tony, he has taken up running marathons as his "hobby"...and has run in several professionally making him a two sport athlete as well. Unfortunately no cards of his running. I did not know that! He's a great TTM signer. Would be cool to get ond of those signed. THAT ONE'S FOR YOU, KID! I was still a toddler when the last of the two-sport athletes were around (Bo, Deion, Brian Jordan), and I'm fascinated by them since it seems more and more likely we'll never see a two-way player again. I'm glad that you like the Stoddard cards and thought you would enjoy the one with the snippet on his baseball career. I am actually disappointed that there are not more college baseball pictures of him floating around. State actually remodeled their Sports Hall of Fame last summer and they barely mention him even though he is in a member... http://thesnortingbull.blogspot.com/2017/01/ot-reynolds-coliseum.html If you scroll down to the Carlos Rodon jersey he is mentioned on a placard with a picture of Joey Devine.